Solomon would hear as Noir began walking away, he looked to her when she spoke to him but said nothing. His first duty would be to see Val off, this was the beginning of something larger than himself and he needed to see it on. After everything was packed and divided and Val took his leave he would then follow her. Noir would point ahead and he would look to see a tree, surprisingly enough this tree was a regular and fully growing tree he would compare it to the tree's he saw while in the dungeon. He would walk up to the tree and Noir would have seated it took him a moment of standing before seeing her pat down signalling for him to come up next to her and sit. After sitting next to her she would congratulate him, and ask to be heard. He would nod in thanks of the congratulations and sit quiet to listen to what she had to say to him. “What do you think of her…? The girl that was me but was not me…” Noir would ask a straight question towards Solomon without even giving any other casual talk before. Her dark side adored the Imuchakk, seeing him as the source or the key to freed herself and gain control of the body for a simple reason. The black haired girl looked down before holding her hands together tightly, she was afraid but she knew she needed to discuss this thing with someone sooner or later. Solomon might be the most suitable person for Noir to talk about this actually, as he was the one that knew her and got to see her other side as well. At first, Yakuroro might be the fittest, but with his soul no longer residing in his body, there was no way to talk with him. He would turn to look to her after he finished stretching his legs, "I'll always help you if you need it, I just have to be around to be able to help you or at least you will have to come find me. Yes your suppose to be able to rely on your friends but your friends must know you in trouble before you can blame them for not helping." When Solomon asked about her mentor’s name, it was like snapping her out from her own thought and she would take a few seconds to answer his question. “…Yaku…Yakuroro, I think it is his real name. I wouldn’t blame you for that; it is only natural for you to feel like that if there’s something malicious residing inside me. I might need to research about this matter...she makes me feel like I am a beast whenever I lose control of myself, perhaps this is not just a mere split personality case…” After she said that, the girl would look down and murmured, “I just don’t know who I can trust anymore…” It already happened for several time, those people that she thought can be trusted or could be her friend turned out didn’t have same wishes like her. Her first mentor tried to kill her but perhaps his sense of empathy spared her from death back then, now she accidentally killed her current mentor but she was not sure about what to feel. Thinking back to what she said earlier about researching the matter about her, he would look and ask her, “Perhaps clairvoyance magic could help you? I read about it a bit when I was looking into life magic ... Clairvoyance magic seems to be magic of the mind.” He paused for a moment to take a look at how she looked as he did not wish to bother her too much as they were just in conflict. “Maybe you could save me some time and tell me about this power I just obtained? ... it seems you have a djinn of your own.” He would look at his axe that was now the vessel of Ronove he would look at its’ shine and the jewel within it, it reminded him of his son and the axe seemed as if it was placed there just for him.Then looking to her as he held it, “Do you carry a vessel of your own?” He did not wish to talk of troubles too much he did wish to fix the relations they had with one another, he did know he would have to solve the issue of another Noir before he could trust her with his life however the immediate priority would be there social standing and moral standing with each other. The black haired girl couldn’t imagine how the Imuchakk man that she knew could say something like this, it seemed that the feeling that she had before about this man was right…he was a little bit off but somehow Noir could understand why. “…I apogize, but I don’t… I caused his death, it was me who ended his life… but he didn’t do anything wrong. True he caused a lot of mischief but I could tell there was something else that controlled his action…” She remembered those swarms of black rukh in several moments, fluttering around the dead Imuchakk when he was still alive as if it helped to drown him into madness. “…and I don’t know how to trust people because some of them has different rukh color… and I might need to look for more information about that…” The black haired girl was not sure, most of the people that she thought she was close with had different rukh color, most of them had black colored rukh. Adrastos… who changed. Yakuroro who despises fate and now was death by her hands… Who knows what might happen to Lance who also has black rukh. However, Noir’s worries was now focused more to Solomon, mostly because of his rukh color and the change of his belief. Just when Noir wanted to say something about it, Solomon mentioned something about Clairvoyance magic, the girl tilted her head as her mind recalled the theory about that certain type of magic. It was true that the clairvoyance magic was some kind of magic of the mind, but to be able to unleash the true power of that magic type was not easy as it required a strong mind and a lot of Magoi. She began to note that in mind, listing all the stuffs that she needed to do once she got back to Magnostadt. Solomon understood how noir was viewing the situation as this man was a teacher to her, and with her situation he viewed it quite similar to his; however he knew that not everyone had the situation she had. He believed that most people chose their actions, he may not have chosen to be that malicious or take such a dark path but the decisions he made while on that path defined him. “That is where we differ my friend, too me if he were to attack you I would go on the defense for you as well just as I did Val. That alone is a wrong that I cannot forgive, I believe if someone is to hurt those you care about you kill that person, if you can’t you defend that person and if the hostile person dies there is no reason to feel guilt. One may have not chosen the dark path they are on, but they can decide what they do while on that path.” He would listen to her as she spoke of the different color rukh but that was not something he could understand as he could not see them to begin with. He knew about what rukh was as he read a slight bit about it in the book when he was studying however he never looked in depth about it. Solomon smiled when Noir agreed to help me, “Then I do not wish to keep you long from your travels so I can assist you in your burial, this way we have a bit more time to learn before you head off.” Solomon would stand and stretch, he would look to her and await her decision, either way he knew they would have to find some equipment. He was also quite eager to learn about Ronove and how he could possibly harness such powers to help him create his own country and defend it. The black haired girl closed her eyes as Solomon spoke to her about his own opinion, something that she, once again, didn’t expect him to say. He went through the darkness on his own, losing his family without power to fight back or to save them, no one was beside him at the moment. He was forced to snap his mind out about it, probably manipulating his own thoughts and beliefs, making him as what he was at the moment. Noir was worried about this man, worried that he might go to the dark once again and devoured inside without any chance to get out because the last bit of his sanity, purity and humanity would be tainted. Perhaps… that was what Yakuroro had been through; something on this man made the female magician imagined that he might be a pure man once, a man who was filled with justice and all the kind values inside him. They said, people like that was the one that would be easily fallen more than those who weren’t that pure …and that was what make Noir gave her pity towards the fallen Imuchakk. Noir would stand up as well beside Solomon as he stood up, but she would bring herself to face the giant. Her small hands would find themselves touching Solomon’s cheeks; she could barely touch them because the height difference maybe but at least she could touch his jaw. “Whatever happens… don’t give in to the dark… don’t seek power from the darkness… or they will corrupt you, devouring you… until there won’t be any single piece of you left in your body…” She would remove her hands from Solomon but they would begin to touch his hand instead and lift it up before putting it on her forehead. “You are too important… I do not wish to lose you to the darkness.” However the girl wouldn’t explain more of the meaning of her words as she began to command Haku to start digging the ground, right under the big tree where the three of them was sitting at. Noir would hold Yakuroro’s body on her side, waiting for her liger to finish digging. “If taking your soul meant I can free you from the darkness…then I wish you could be filled with purity in the afterlife…” She would look at the staff that Yakuroro once held, along with the other belongings of the dead man. “I will take one of those items for a reminder… I hope you don’t mind.” She whispered as she flicked her wand, covering the man’s body with ice and asking Solomon to put him in the hole before burying the fallen Imuchakk. Solomon was slightly confused when Noir struggled to touched his cheeks however after she spoke he smiled, “For me it is not a matter of light and dark, for me as long as I have the people I care about around I will fight and live for them. That is why I wish to create my own country and come to care about those people within it. I will fight and care for them as they will care for me I hope, and eventually maybe each person will see each other as family rather than strangers... You won’t lose me, unless I one day die for something I believe in and then that is the best death one could ask for.” He would not interrupt her when speaking to her dead master and would allow her the time for a proper good bye, when asked to put Yaku’s corpse into the hold he would just nod and hop down into the hole to set him down properly. The liger watched as he sat beside the Imuchakk’s grave, wondering if Noir would teach him in the same way like how the blue haired man taught her before. As he let out a big yawn, Haku leaned against his stomach and placed his chin on his paws, thinking that he should just get some rest since this might not be a short training. Noir raised her right arm where the armband was attached and chanted, “The Djinn of Drought and Dehydration! Dantalion!” Large amount of magoi would start to gather around the armband, making the ruby gem and the eight pointed star engraved on the armband glowed as magoi started to being absorbed by it. Thick vapor started to emit around Noir’s arm and suddenly a scythe was in the female magician’s grip. Solomon listened intently and looked towards the symbol on his axe, seeing it's location he figured it might not be that hard to protect it however he knew he would still have to be quite cautious with it. After watching awhile he became amazed with her weapon, not that it just appeared in front of him but again seeing such a wondrous and mysterious item. He could not even think of which nation would possible use such a design for a weapon, it was quite unique to her. After hearing how she could do it he would attempt it himself, he was curious if it was already a axe what would it possibly turn into. He would feed what little magoi he had left to the axe and it would take it in, however it would just keep sucking it it to the point that Solomon had to stop before the axe would take far too much. He would look to Noir, "I guess I don't seem to understand, It will not change for me... And I have trained well with magoi manipulation prior to this." Solomon was stumped as he looked back to his axe. Solomon would not know this but Ronove was watching him intently from within, she had no intention on changing such a weapon that he cherished when he first picked it up into something other then that ... at least not at this stage. She enjoyed watching him try though and she could tell him but she did not wish to yet, she wished to see how his master would fair with the women with him. He would look at the jewel in his axe and smile at it's beauty it was as if he was staring into the eye's of his son, and Ronove would have the chance to stare into his in that time. He would eventually look back to Noir as ask, "What is that chant you had said? Perhaps that is why nothing happened? Do I need some sort of chant?" He would think to himself about the prior dungeon and there was nothing specifically spoken to him before the end of it. Solomon would look to Noir still intent however awaiting some more instructions. 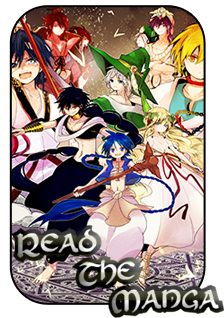 The girl would make lift her scythe before pointing it towards Solomon before continuing her explanation, “Weapon equip… requires you to manifest your magoi that you are pouring into the metal vessel so it can turn into a weapon with the help of the djinn. Don’t just thowing your magoi at the axe, you want to tightly compress that magoi into the axe. Imagine that it is a pot that is much deeper that it looks. You should be able to pack the magoi more tightly.” Noir reciting what Yakuroro taught her once again to Solomon, hoping that this time he would be able to do it. However, she was not sure if the Imuchakk could understand the concept, so far she could understand how it worked because she was a magician, someone who could draw the concept how she should manipulate her magoi. Solomon only remembering when she spoke that she did not know personally about how the magoi manipulation worked with a warrior, but he would still remain silent as she spoke. He watched as she used her bracelet and then would drift away into thought only for a moment, however in that moment he would think of his family and the face of the man that took them away. Anger would appear on his face and he would feed what ever he could into the weapon seeing the jewel in his axe however would make him stop, he couldn't look at it and be angry. Ronove smiled but realised that what she decided would impede him so would allow the blade to change, she would whisper with no one to hear, "One will be the memory of your child, the other will be the judgement maker for those you must use it on." Solomon trying again to feed his magoi into the blade would then have it transform into someone quite different then what he had before. 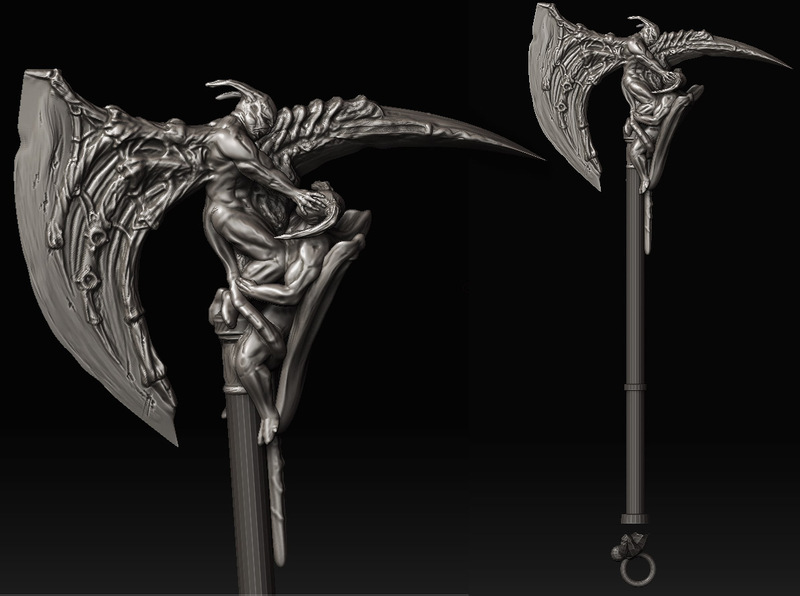 It now looked much more crude then before with all the color drained from it, and the gem seemed to have sunk into the weapon transforming the top of the axe into what looked to be a demon of sorts casting another demon down leaving only the magic symbols. He would look to Noir, very happy with himself and say, "Think I understood you now." Looking back at the axe even though it's elegance has left it during this transformation he was still quite happy with it. One it means that he is growing and the power he seeks is growing, however it also allows him to show others that there is no black and white or evil and good. He found that his weapon would show others that there are many shades of grey in between, even though his axe looks fiendish he would still use it to protect those he cares most for. He would then release the weapons equip by stopping the flow of magoi to it as described by Noir then looking to her, "Thank you for teaching me this... hopefully by the next time we meet that I am able to do a whole transformation like your self. However I do not wish to keep you here training me forever." Solomon smiled to her as he said this, he knew that she would have to leave on her own path for some time especially to learn about her other self and how she could possible control such a thing. He would raise his arms above his head as he stretched backwards then forwards again before stopping to ask, "Do you know where you are heading next? Or of a way to contact me if need be?" he took a moment and remembered about the journey book he once carried however that was terrible as he did not know if it even worked as he never talked to Hoho since he left. "I do not know of a way myself ..." he would say but then he would lift his arm as he spoke, "... but I do know if you ever need me you should be able to find me in the jade dragon mountains of Kou. That is where I plan to begin everything." He smiled and before she spoke he would say, "I do expect you to come one day." The black haired girl saw the manifestation of Solomon’s djinn in his grip, his axe changed shape into something that made Noir couldn’t help but to keep her eyes to that weapon. It was the third weapon equip that she saw and all of them had different kind of aura emitting from it, making Noir wondered about how the Djinn could get their power. She wished to talk to the Djinn actually, wanting to get more knowledge about their history. However, no matter how many times she tried to talk to her djinn, there was no answer from Dantalion. “It would be better to keep training this weapon equip so you can manifest it for a longer time, making yourself getting used to perform weapon equip.” She stopped feeding magoi into her metal vessel and her scythe dissolved into a vapor as she walked towards Solomon, approaching him. “Djinn equip can be performed by using the same method, however it will require more magoi. However, I am sure you will be able to do it and no, it is alright. I don’t wish to keep you here to do more training as well, you have a goal to be achieved after all.” She smiled back to him as Solomon smiled to her, waiting for him to finish his question about her destination after this. As a way to contact each other, the black haired girl could try to learn Clairvoyance magic, but in order to learn it, she maybe need to go back to Magnostadt. Although it was not necessary to learn about it there, she might be able to learn that magic type when she found appropriate information and knowledge to perform it. “It is time we part now.” Solomon would say as he opened his arms and walked towards Noir, if allowed he would then hug her and say his farewell before turning to leave the area. Noir nodded, didnt say anything more because it would be nice if the man could try to find out about how to do the Djinn Equip on his own. It could be something like an achievement for him, something that might make him proud of himself as he fed that little curious side in the small corner of himself. "I understand, hopefully we can meet again soon. I hope the best for you, dear friend..." The black haired girl said it, making sure that Solomon knew that she really thought that he was a friend of her, someone that didn't just disappear on her and gave her false hope of a friendship. He was one of the people who taught her a lot of things, probably what he taught was the most important for the girl herself. When the giant approached her with an open arms and hugged her, Noir wrapped her arms around the man as well and felt his warmth. He smelled like a summer breeze for the girl and she found it strangely comforting. "Until we meet again then... Good luck." She waved her hands as he left and decided to stay at Yakuroro's grave for a bit longer.